Guitar teacher, Wayne Dabner felt passionate about the accessibility of music, particularly for those living in rural areas. With a vision in mind that music lessons should be more available outside of towns and cities, he set about establishing his own music academy to serve the people of Oakham and the surrounding area. Wayne told us how his vision of Rutland Music Academy has become reality with the support of Nwes. Can you tell us more about Rutland Music Academy and what it offers? I have been playing guitar since I was eight, going professional when I was in my early twenties. I signed a record deal in my late twenties and toured extensively through all these years. In my thirties I came into teaching and found I could evolve within this sector. 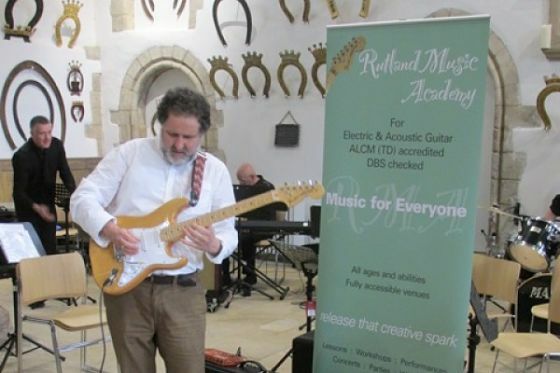 Rutland Music Academy launched in late 2016, and offers guitar lessons as therapy for all in the community, often leading to performances and concerts. I have been driven by a desire, not to become rich, but to share my knowledge and love of music. I now offer guitar lessons suited to the individual student, their needs and goals, whether they are academic or personal, and I offer lessons at fully accessible venues for service users. Who or what was the inspiration for Rutland Music Academy? There is a real need for a Music Academy in rural England. As a not-for-profit organisation, Rutland Music Academy is beginning to address that need. Many very talented musicians from all sectors of the community do not get the access to music they deserve, as well as beginners exploring possibilities they would like to explore. I contacted enterprise agency, Nwes and was put in touch with local Business Advisor, Sergio Aschettino. Through the Signpost to Grow programme, part financed by the European Regional Development Fund, Sergio worked with me to provide business support and advice in order to develop my knowledge and skills. Working with Sergio has helped in so many ways. He offered good honest advice on all matters of business skills, practical tips on motivation and focus, and how to set realistic goals. I have encountered some challenges when it came to marketing, but I am resolute that this is outweighed by the highlights of being able to make the decisions as the business owner, and my belief that Rutland Music Academy works for all people in the community. The first lesson with my first customer was very exciting as it really highlighted both the musical and psychological nature of teaching music. What does the future hold for Rutland Music Academy? I have ambitions of expanding into premises that is fully accessible to the whole community, with the teaching of all musical instruments by qualified music teachers. My vision also includes musical workshops, performances and concerts in selected theatres, not just locally, but nationwide.